It's not everyday that one comes across a Mad Scientist birthday party, yet alone one, for a 7 year old girl! So when I got a call from the Event Stylist, I was super excited! They are the talented bunch from Mint Events and Soirees who create fantastic tablescapes and styling for any event. Do check out their work and be prepared to be in awe of the great detail, these girls are capable of. 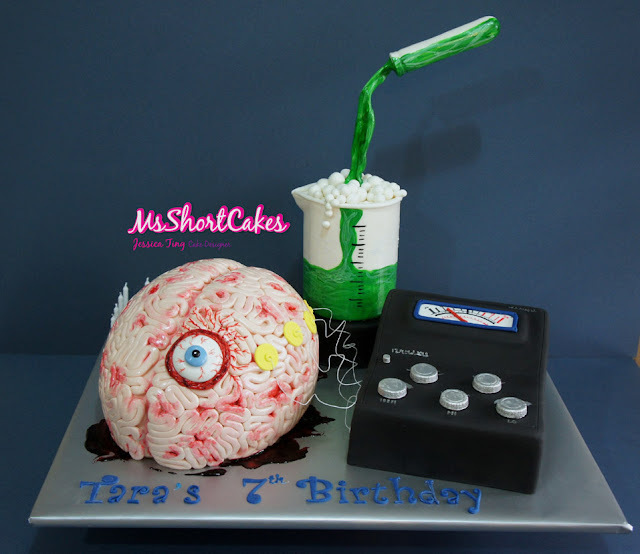 As per usual, I trawled the internet for ideas and Googled "Mad Scientist cake, Mad Scientist Party, Brains cake", to name a few. Most of the cakes were of beakers and test tubes and nerdy glasses. Nothing caught my eye. 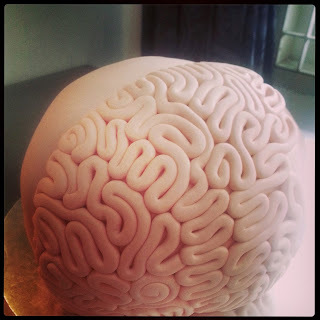 The feature of the cake would be the brains. And not just any brains. This would be the brains that the Mad Scientist was working on. And something completely twisted happened in his laboratory, and the brains sprouted one oozing, bleeding eye. The brains would then be connected to a "Brain 'o' meter, which was a black box, complete with dials and meter reading, and connecting wires. Behind this experiment, was a bubbling beaker, filled with green liquid and bubbles, and the liquid was pouring out from a suspended test tube. It was a great plan, genius, I might add :) I was so excited about this project. Work began immediately after I got client approval, and I began making the test tube and bubbling beaker. This would be the only part of the cake which was non-edible. It was so much fun! By the end of the day, it was complete. It looked really good for my first attempt! 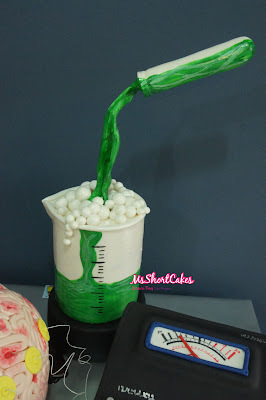 Because of its size, if it were to be edible, the beaker could be cake, but the test tube must be styrofoam. It'll be too narrow to make it out of cake. The carving of the brains itself took a little longer than expected. But once that was done, it was just a matter of covering a thin layer of light coral icing over it, then making all the squiggly bits (I don't know what the medical term for this is :)). Thin, long sausages were rolled and then positioned in coils all over. It was quite therapeutic. 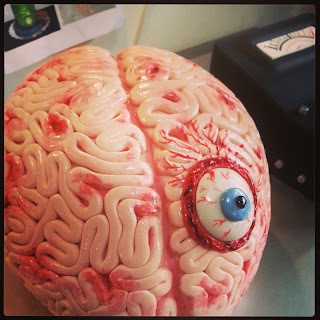 Bit by bit, the brains got covered and soon, it started to look quite gory. The Brain 'o' meter was created by compiling a few different photos of "scientific meters", that I found on the internet. I decided to make it slightly tilted, instead of flat. This would make it look more realistic. The dials and knobs were all made from gumpaste and then painted with silver lustre dust. Finally, the last stage was putting it all together. This was the easy part, since all the components were ready. I mounted the beaker on a black platform, to give it extra height. 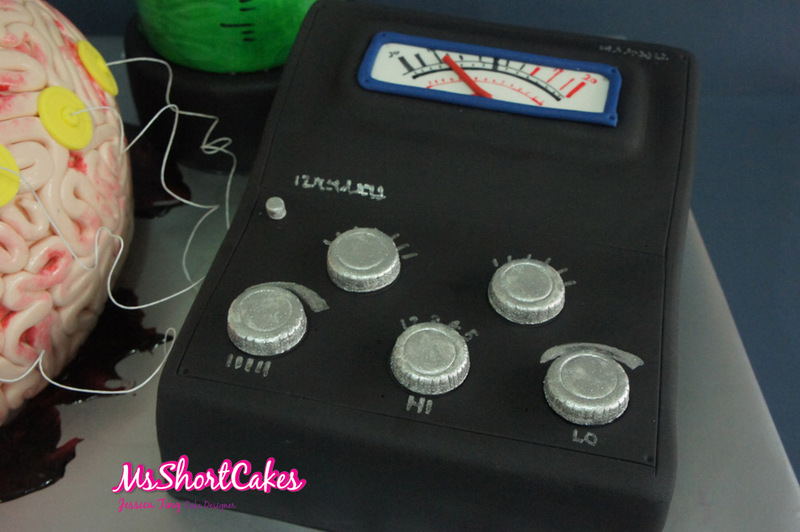 Then connected the brains to the Brain 'o' meter with 28 gauge wire and suction caps. The last touch was to make the brain look bloody. So I coloured piping gel with red food dye, and squirted it around the brains.